We are offering a short 6 week program to help you keep on track with your fitness gains and goals. We know it is tough, especially during the holiday months. This program will help hold you accountable and introduce you to a whole new group of friends. Fun prizes and incentives will be given out to keep you motivated for the duration of the program. Goal: To maintain fitness gained from the Fall season of our No Boundaries training program and improve upon it. 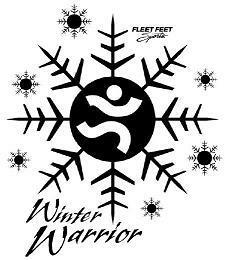 Stay fit and active during the winter months. Cost: $25. If you meet the challenge, you get a $40 gift card at end of program. Duration: Starts 12/11 and ends with Ontario Mills 5k/10k on 1/19/2013. Times: Tuesdays at 6:30pm and Saturdays at 8:30am. Excludes 12/25 and 1/1. We will have extra credit events for the Holidays! The Challenge: Make 8 of 10 training days to earn $40 gift card. You can use Fun Runs and Special Events to make up for a missed day during that week. For example, you miss Tuesday, but come to Thursday’s Fun Run as a make up. Or come to the other runs and events for extra credit towards the Ultimate Warrior Award! The Ultimate Warrior Award: The person who ends with the most points by coming to the most training sessions, plus other events (extra credit), will win a special prize basket with goodies! We at Fleet Feet Sports hope to see you! Visit or call the store for more info.